We’ve loaded this chili with beef and beans for zinc and B vitamins, tomatoes and green peppers for vitamin C, and butternut squash for beta-carotene. FREE TRIAL – Recipes & More! Cook beef, bell pepper, and next 2 ingredients in a Dutch oven over medium-high heat until meat crumbles and is no longer pink. Drain well, and return to Dutch oven. Stir in tomatoes and next 5 ingredients; bring to a boil over medium-high heat. Cover, reduce heat to medium-low, and simmer, stirring occasionally, 15 minutes. Stir in corn, and cook, uncovered, 15 minutes or until squash is tender and chili is thickened. In a small bowl combine the cumin, chili powder, pumpkin pie spice, oregano, 2 teaspoons salt and a few grinds of black pepper. In a large pot over medium heat add the olive oil, beef cubes and half of the seasoning. Cook until the beef is browned on all sides, but not cooked through; remove with a slotted spoon to a plate. Add the onions, bell pepper, garlic, tomato paste and hot sauce. Stir and cook until everything turns a dark reddish brown, about 10 minutes. Add the ground beef and sprinkle over the remaining seasoning. Stir and cook until beef is browned then add the reserved beef chunks back to the pot along with the cornmeal, wine, stock, and the squash. Raise the heat until it comes to a boil, then lower to a simmer, cover and cook until the beef is tender, about 40 to 45 minutes. Uncover and let the chili cook another 15 minutes, until it is thick and the liquid is reduced. Top with chopped fresh cilantro, red onions, and grated cheddar cheese, if you like. Heat oil in heavy large pot over medium-high heat. Add onions and garlic; sauté until tender and golden, about 9 minutes. Add squash; stir 2 minutes. Stir in chili powder and cumin. Stir in beans, broth, and tomatoes with juices; bring to boil. Reduce heat and simmer, uncovered, until squash is tender, about 15 minutes. Stir in chard; simmer until chard is tender but still bright green, about 4 minutes longer. Season to taste with salt and pepper. Ladle chili into bowls and serve. The addition of sunny yellow squash gives this hearty chili a bright summer flavor. Don’t be afraid to dip your bread straight in the bowl. This recipe comes to us from Grace of Going to Graceland. Heat the olive oil in a large stew pot over medium heat. Sauté the onion, carrot, bell pepper, celery, zucchini, yellow squash in the olive oil for 8-10 minutes or until vegetables are tender. Add the canned beans, tomatoes, chili powder, and oregano. Mix and simmer for 20 minutes. Just before serving, season with salt and pepper to taste. Send us your Meatless Monday Recipes! Goofy noodles, fancy bacon, & squash? I’m in. Bought some Campanelle because boxes of pasta were cheap, and it looked neat. SAUTÉ pancetta in a large skillet over medium- high heat until crispy. Drain excess fat.Set aside. HEAT olive oil in the same skillet over medium heat. Add onions and rosemary, sauté until golden. ADD the butternut squash and the chicken broth. Simmer for 10-15 minutes or until the squash gets soft. DISCARD the rosemary. Season with salt and pepper. Process half of the sauce in the blender until smooth. Thin sauce with more chicken broth if desired. Return sauce to pan. COOK pasta according to directions and toss with the sauce. TOP the pasta with pancetta , drizzle with Balsamic vinegar. Visit BarillaUS.com for more delicious Italian recipe ideas. ©2010 Barilla. All Rights reserved. Recently, we had a ridiculously excellent fall dinner. I could eat this meal several nights a week, and not grow tired of it. 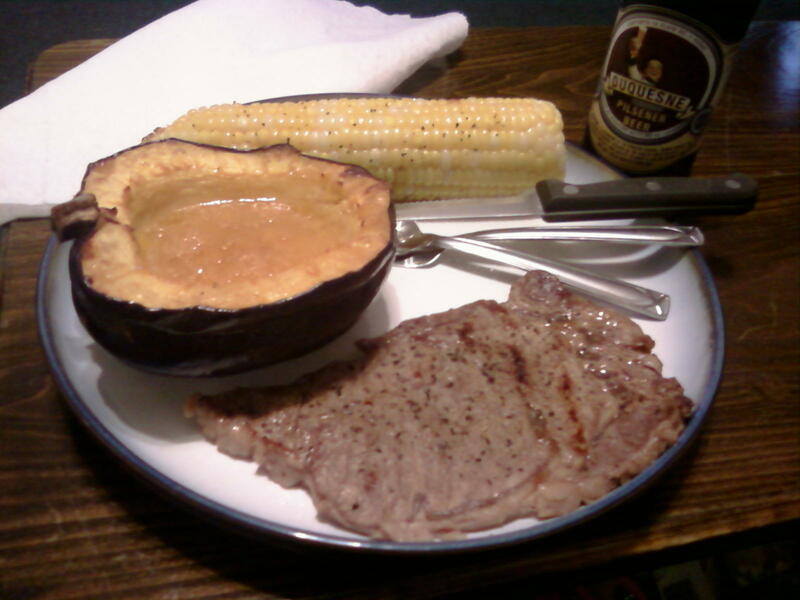 Acorn Squash, Corn on the Cob, Skillet Steaks, & Duquense Beer! 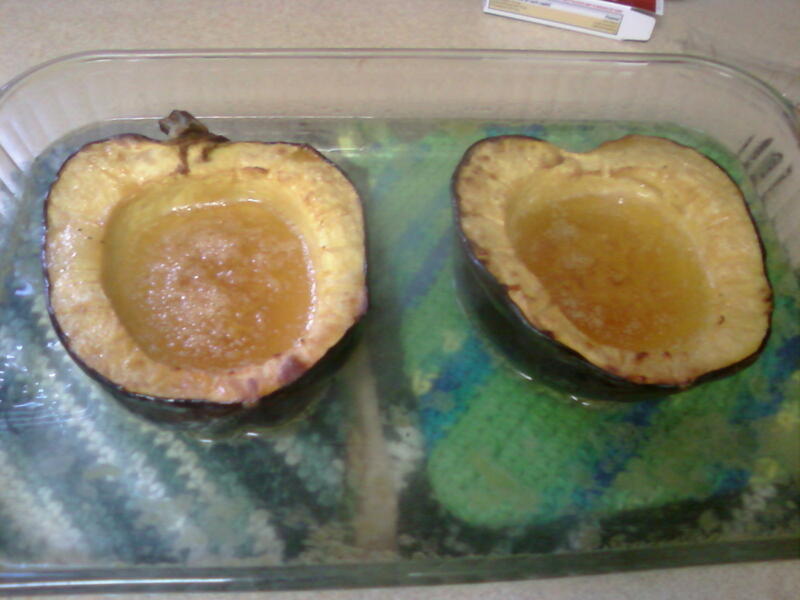 First up was the acorn squash, which is really easy to prepare once you get the damn thing cut open. I have recently stopped trying to go through the whole thing at once. I use a serrated knife and poke from the beside stem into the center, then slice out form the stem all the way back around until I hit the stem again, then crack it open. I melted some butter (or some Country Crock spread actually) in the microwave, probably about 3 tablespoons worth, and added a little bit of brown sugar, stirred, then ladled it on the top & into the cup formed in the middle. Add it to taste. I don’t really ever measure this. If you’re looking for a measurement form me, add what you think is too much brown sugar, then add a pinch more. I also added a tiny bit of black pepper & paprika to mine this time… but I add that to almost everything. After that, I placed it in the already pre-heating oven at 400° for about an hour and 5 minutes. I was going for somewhere between an hour and an hour & 15 minutes, and it worked out closer to the hour this time. Check on it around the hour mark. This one was roasted perfectly… the meat of the squash was just melting on to the spoon, & peeling right off of the skin inside. It was really a great flavorful vegetable. I don’t know if this is baking or roasting, but whatever it is, it works. It would have also been good scooped out & served like groovy orange mashed potatoes. 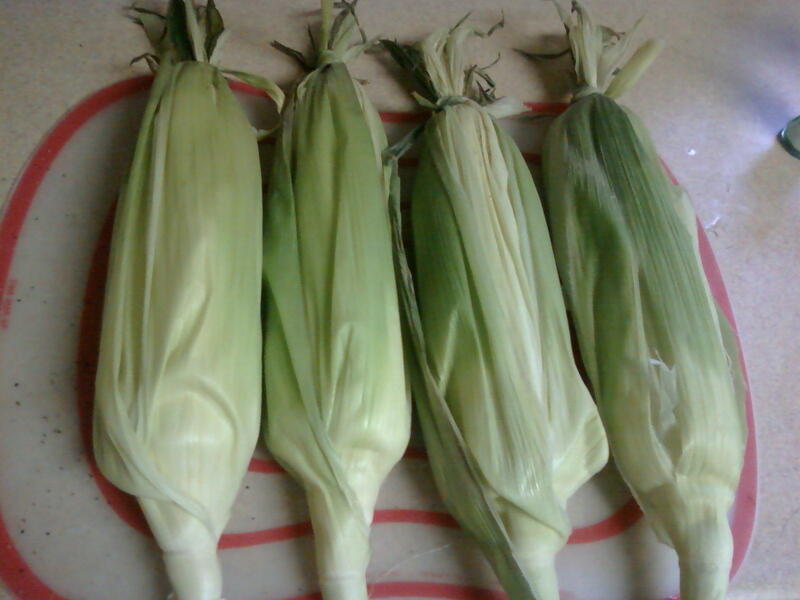 Corn, undressed, re-dressed, & bound for doom! Up next was the corn, figuring temperature was more important for the squash, I typically roast corn at 425° or 450° for 20 minutes to a half hour… but figured why not let it ride along with the squash here? My wife & I carefully pulled back all the husks… just pulled them back not off, then removed the silk. We buttered (again, we used Country Crock’s butter approximation), salted, & peppered the corn. Next we wrapped it back up, and tied the tops back together using a loose strand of the husk. This doesn’t always work out, so sometimes I use foil & make little caps to keep ’em all bound together. Why would you boil corn, when you could have this awesomeness every time? I wish my cell phone’s camera got better shots. I need to think farther than Facebook or Twitter when taking food photos, and get the real camera so I can post more to this blog. 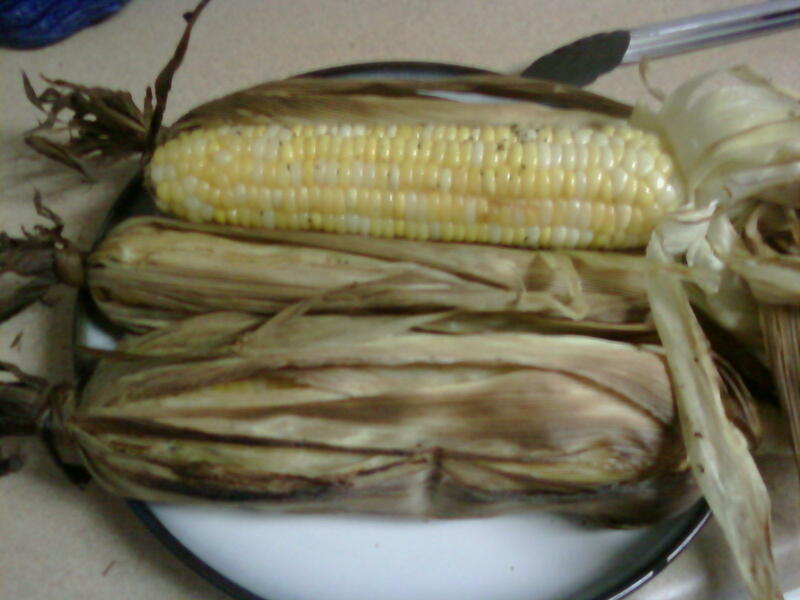 The corn husks did smoke a little… but I didn’t see any flames, and it let me know when it was done. Ha ha ha. I’ve grown to not rely on timers so much, but to go with temperature and a gut feeling. Oddly enough for a carnivore like myself, the steak was not the star of this meal. We just got some thin skillet steaks and put them on the Foreman grill oiled, salted, & peppered for about 5 minutes, maybe a little less. They turned out fine. The Foreman Grill seems to be my go-to tool for cooking meat until I get new knobs for by real grill outside. I’m in a Yahoo! Group that’s a really good resource for innovative GFG cooking. I topped it all off with the newly resurrected Duquesne Beer. [Insert zombie and or Jesus joke here.] I have a collection of antique bottles and have a Duke beer bottle in with my local stuff… so when I heard that they were making it again, I knew I had to try some. I was born after the company was dissolved the first time, so I can’t compare it to the original… but it is a nice mellow pilsner that goes well with this kind of dinner. It rounded out the meal perfectly. It was aggravating to get my hands on some though… they’ve had a weird release schedule, and no 6 pack shops around me were carrying the stuff. When one local pizza joint was listed as having the stuff, I went there to buy some and they had no idea what I was talking about. I ended up buying a case, but luckily I don’t feel “stuck” with something that I don’t like.